Most people who know me know I like sweets but because of health reasons, I only eat them in small amounts. My favorite is chocolate (especially chocolate with mint or toffee). My husband, though? Not so much. He’s developed more of a sweet tooth since marrying me but I swear he would have had steak as his groom’s cake instead of actual cake at our wedding if I had agreed to it. The one exception seems to be blueberries. Not just anything flavored blueberry, either. I am always buying him blueberry flavored stuff and sometimes it hits the mark and sometimes it’s out in left field of dessert land. So last year when he found a blueberry dessert on Facebook, we of course made it. And we both loved it. A lot. It’s a blueberry crunch dessert that you make on the grill, which means two things: no heating up the oven and it gets a rich, almost smokey flavor from the charcoal. Another aspect of this blueberry crunch that I like is that it uses pineapple to blend with the blueberry instead of the traditional lemon. John really doesn’t like lemon-flavored anything and I’m not a big fan of blueberry and lemon together. I honestly don’t know where the original came from except for “Facebook” but I was able to find it in a couple of places like here. We used almost identical ingredients with some variations for taste or, if I’m being honest, because I got the wrong stuff. 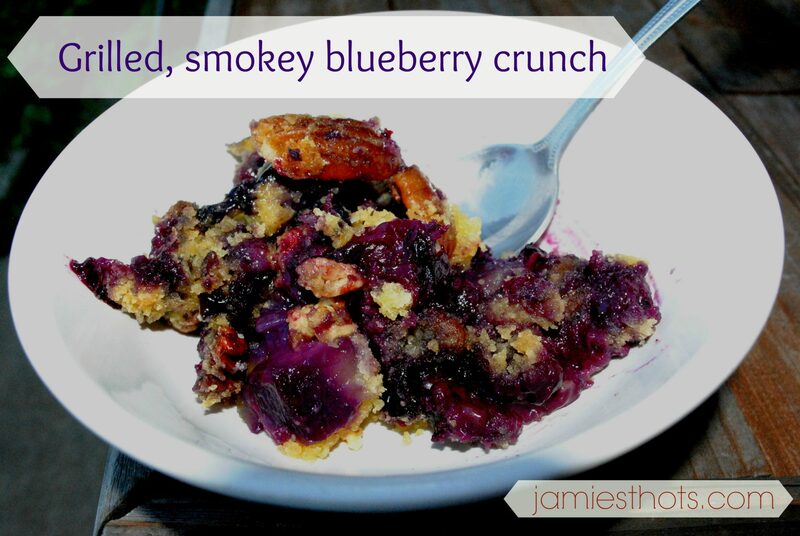 This blueberry crunch is amazing on the grill. Grill the dessert for about 20 minutes then poke it 21 times with a fork. Grill for another 20 minutes. I have no idea why it’s supposed to be poked 21 times or really why the coals have to be pushed to the sides. But that’s the instructions and I’m a little afraid to poke it 20 or 22 times. The dessert will be hot so handle with care. I can’t eat ice cream but I bet it would be fantastic ala mode. So what blueberry deliciousness do you have? Please leave your favorite blueberry recipe in the comments. Tip: You can cut the liquid when using frozen fruits by draining them in a sieve. Ooooh. Good tip on the frozen berries. I never thought of that. Yes, you should make this on the grill! I adore blueberries but had never thought of doing something on the grill with them. This is wonderful. Bet you could use fresh pineapple as well…yum yum… thanks so much! Yes, I wondered about fresh pineapple but wasn’t sure how to get the juice. I love that it’s on the grill! Oh my! That’s looks Delish! I just picked tons of blueberries! I must try this! Thanks for sharing! Thanks for commenting! Yes, it’s DELICIOUS. Great for the summer because it’s on the grill.